Part of the Special Exhibition Events category. In celebration of the opening of our most recent exhibition, Oh, Shenandoah: Landscapes of Diversity, Washington D.C. artist Andrei Kushnir will lead a tour through the gallery that reveals his personal journey painting more than 260 landscapes of the Valley that explore the extraordinary beauty, history, and vitality of the region. After experimenting with various media, Andrei Kushnir started painting in oils in 1980 and quickly discovered the joys of painting landscapes outdoors, en plein air. Essentially self-taught, Kushnir developed a naturalistic, realist style that focuses on the American landscape. 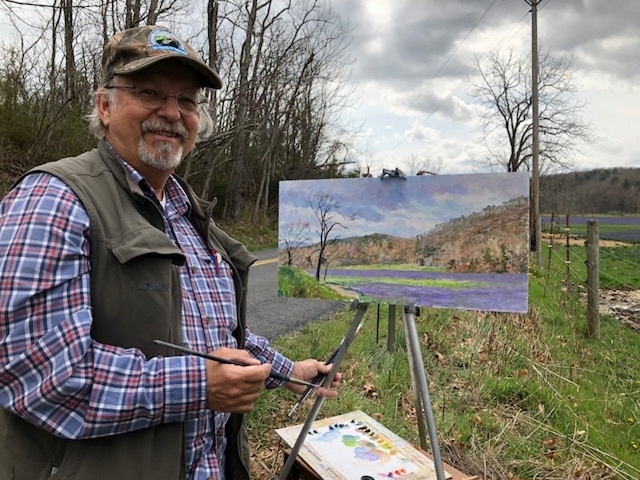 Along with painting the Shenandoah Valley, he has also painted along the shores of Maine, New York, Cape Hatteras and Florida’s Gulf Coast, as well as in the Western U.S. states, particularly Colorado, New Mexico and Arizona. His work has been exhibited across the United States. Kushnir will be available to sign copies of his book, Oh, Shenandoah: Paintings of the Historic Valley and River after the tour. Free for members or included with the museum's suggested admission. Meet in the Susan and David Goode Gallery just before 1:00 pm. Learn more about the exhibition Oh, Shenandoah: Landscapes of Diversity.